The Sazerac is as NOLA as Po’Boys. Louisiana’s official state cocktail as of 2008, the Sazerac is a cocktail in the strictest sense; booze, bitters, sugar, water. 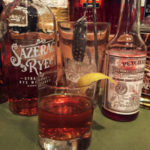 In the Sazerac’s case, it’s rye whiskey, Peychaud’s bitters, a touch of sugar, stirred with ice and poured cold into a glass without ice, and garnished with a lemon peel. Originally made with cognac, until the phylloxera outbreak in Europe made brandy a hard thing to come by, the Sazerac is as NOLA as you can get. With the rise of whiskey in America, and with New Orleans being the substantial port city that it was, it had plenty of rye (in the early days) whiskey moving through it. Mix that with a bit of Peychaud’s bitters, made by the pharmacist Antoine Amédée Peychaud, a transplant to Louisiana of French roots, a rinse of Absinthe, also a European transplant, and a bit of sugar for balance, and there you have a drink you can celebrate with. So come on in and ask the bartender to make yours with Sazerac rye, back it up with a pork chop, and let’s make the most of this Fat Tuesday.